When I started my FW community tank over a year ago, I cycled with Harlequin Rasboras. After nearly 60 days, I finally gave in and purchased Bio-Spira. The tank was cycled within 4 days. Now, I know its differernt with a planted tank, the process that is. I just dont know where to start. I am figuring you set up your tank, filter, substrate, lighting, ect..., fill with water and then.............. this is where I am lost. Do you start with fish first or do you start with plants, then add fish? Can you start with both plants and fish? Is Bio-Spira still an option? I have tried looking on the nest for answers but haven't found any. I am hoping a kind soul on this forum will please explain the process. If you have fast enought growth (high light, and fast grower) you do not need to cycle at all - the plants will absorb ammonia, until the bacteria increase in numbers. It is a little harder if you have a "lower-growth" planted tank. The safest way, would be to go with a regular fishless cycle, and then add plants, lights, ferts all at the same time. Some people will suggest putting the plants in the tank during the fishless cycle - but I don't think this is the best option - strong light + ammonia = bacteria bloom. Also, I had a recent tank disaster that suggested that some plants will die if the ammonia is too high. My suggestion is to start with your plants (lights, ferts and all) and a very small number of fish. Then add a few more fish after a couple weeks. Whatever method, you choose, Bio-Spira is a good idea. I agree with hashbaz. If you have a bnch of fast growers, you will have no need to cycle. But I would also add to start with a few fish first, then add a few each week. Don't add a whole bioload all at once. Then monitor your levels. If you see any sign of ammonia or nitrite, stop adding. But if your plant load is heavy enough, you shouldn't even see any cycle. I am back from both Walmart and Petsmart. I wish Flagstaff had more options. Anyways, I purchase a 10 gallon glass tank for $7.99 and a Incandescent Hood made by All-Glass for $15.99. I then bought 2 Compact Fluorescent bulbs from Wal-Mart. The bulbs are 20 watts and work nicely in the hood. With people telling about how the WPG rule is different on small tanks, I thought 4 WPG would be good on the 10 gallon. I guess I'll try it out and see how it goes. I plan on going to the LFS tomorrow and buying a bag of Eco-complete along with some gravel. 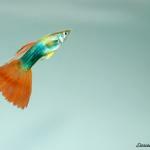 I think I will also order some Bio-spira and add both fish and plants and the same time. I think I am ready to begin the journey. My head is starting to hurt with all the information on the net so I am just going to start. Sometimes it's better to do things yourself, put all the great info together and go for it. I know things will be hard at first and I WILL make mistakes but I'll hopefully learn. Thanks! 4 wpg on a 10 gallon should be a nice medium-high light tank. And small enough that doing a large water change to reset parameters will be easy! Just be careful, though, as things can get out of whack quickly in a small tank.....ask the good folks here at AA lots of questions and you should be all set. I added the following plants and fish along with a load of Bio-Spira. Once again, I am happy with the results from using the Bio-Spira. I also have 1 congenis and 1 ceylon that will be ready to pick up on Monday. As for the fish, I added six gold tetras. What should I look for or check for within the next few days/weeks? Just watch your plants and fish and follow the advice here. You'll probably get some diatoms soon.